We all love fruit! It is such a healthy snack, and we definitely need snacks around for the holidays. Those of us who entertain a lot of guests during the holidays are constantly searching for new fun food to serve. One of my personal favorites are fruit bouquets. Not only are they made out of delicious fruit, but they are beautiful arrangements that can used as centerpieces for our tables and buffets as well. However, if you have looked at the cost of an edible fruit bouquet recently, than you know they are monstrously expensive. Therefore, I went in search of instructions to make my own fruit bouquet this year. 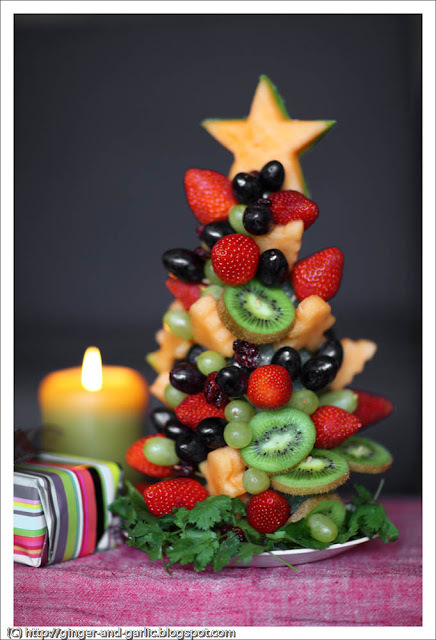 I discovered this gorgeous fruit Christmas tree made by Prajakta Gudadhe and featured on her site, Ginger & Garlic. With a Styrofoam cone, toothpicks, an assortment of fruits and a few cookie cutters, Prajakta made this stunning Fruit Christmas tree. Check out her step by step instructions to make your very own beautiful Christmas Tree Fruit Bouquet. The fruit you select for you tree will obviously change the look of your centerpiece. We would all love to see pictures! If you make a fruit Christmas tree, be sure to return here and share a link to a photo of your own Fruit Christmas Tree. I would love to add a pictorial parade of Fruit Christmas trees below. Certainly looks festive -- and yummy. Terrific idea for holiday snacks.